A long-term focus of my research program has been to characterize and quantify atmospheric mercury deposition and its fate, transport and effects in the environment. This includes work in the Adirondacks and other regions globally. Through this research we have documented pathways of mercury deposition, its fate, conversion to methylmercury (the form that accumulates in biota) and trophic transfer in aquatic and terrestrial food chains. We have observed long-term decreases in atmospheric mercury deposition and lake-watershed total mercury and methyl mercury at Arbutus Lake-watershed presumably in response to recent decreases in mercury emissions. We have a series of projects on mercury effects (Figure 1). We are examining deposition and formation of methylmercury at Whiteface Mountain. In this study, we are using stable isotopes of mercury to elucidate pathways of mercury inputs and transfer to biota. We are investigating trends in mercury concentrations in fish and loons in waters of New York (G. Millard, PhD student; Y. Yang PhD student at SUNY ESF; Schoch et al. in review). At Honnedaga Lake watershed in the Adirondacks, we are examining the effects of liming on watershed mercury transport and transformations (Millard et al. 2018). We are conducting a study of mercury and methylmercury production across natural and constructed wetland types along the St. Lawrence River (with D. Chandler, T. Wang MS student; Wang et al. in review). With Dartmouth College (Celia Chen), we are studying the interactions between nutrient inputs and mercury in coastal waters of New York (A. Shaw, MS student). With Zhangwei Wang (Chinese Academy of Sciences) we are evaluating the accumulation of mercury in rice (Wang et al in review; Wang et al. 2018). With Jackie Gerson (Duke, PhD student) and Gerardo Martinez (UC Davis, MS student), we are investigating the effects of artisanal gold mining on mercury contamination in Senegal and Peru (Martinez et al. 2018; Gerson et al. 2017). With Flor Fahnestock (Univ. New Hampshire, PhD student), we are studying the effects or permafrost thawing in northern Sweden on the mobilization pathways of mercury (Fahnestock et al. in review). Finally, I served as a guest editor for a series of synthesis papers on mercury science and policy developed from the International Conference of Mercury as a Global Pollutant which will be published in the journal Ambio. A synthesis of this synthesis was recently published in Environmental Science and Technology (Chen et al. 2018). I am also serving as a guest editor for the journal Ecotoxicology for a series of papers on mercury in New York State. Figure 1. 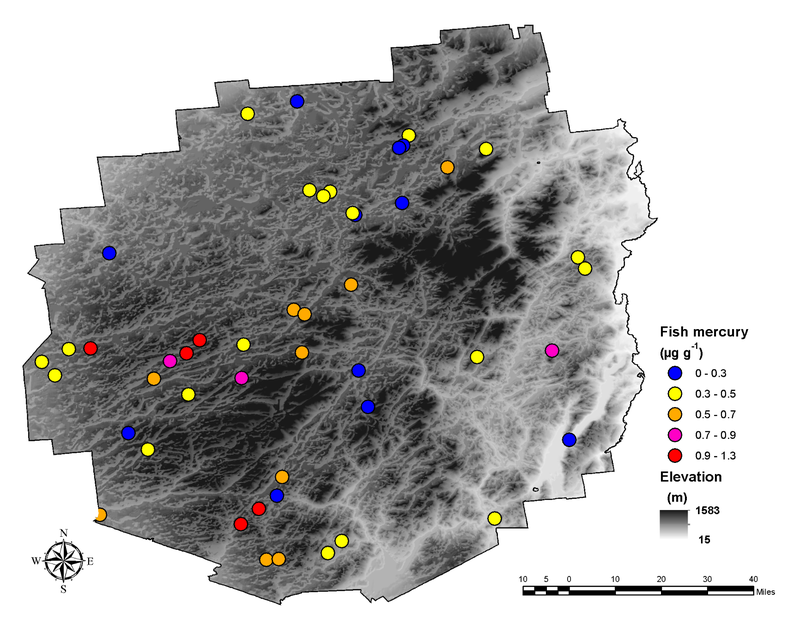 Spatial patterns of mercury concentrations in length adjusted (229 mm) yellow perch in Adirondack lakes for 2003-2005. Values above 0.3 g/g wet weight are in excess of the U.S. Environmental Protection Agency recommended fish consumption advisory. There is currently considerable activity in mercury management. The United Nations Environmental Programme (UNEP) developed an international mercury treaty in 2013, the Minamata Convention, to control on mercury releases. The Minamata Convention entered into force in September 2018. Interestingly, the U.S. Environmental Protection Agency is considering rolling back the Mercury and Air Toxics Rule controlling mercury emissions from electric utilities. We have developed a fact sheet on mercury and the Mercury at Air Toxics Standard which has been widely circulated and I have been giving briefings on this. Chen, C., C. T. Driscoll, C. Eagles-Smith, C. Eckley, D. Gay, H. Hsu-Kim, S. Keane, J. Kirk, R. Mason, D. Obrist, H. Selin, N. Selin, and M. Thompson. 2018. A critical time for mercury science to inform global policy. Environmental Science & Technology. 52:9556-9561. doi: 10.1021/acs.est.8b02286. Fahnestock, M., J.Bryce, C. McCalley, M. Montesdeoca, S. Bai , Y. Li, C. T. Driscoll, P. Crill, V. Rich, R. Varner. In review. Mercury reallocation in thawing subarctic peatlands. Nature. Gerson, J. R., C. T. Driscoll, J. Demers, A. Sauer, B. Blackwell, M. Monstesdeoca, J. Shanley and D. Ross. 2017. Deposition of mercury in forests across a montane elevation gradient: elevational and seasonal patterns in methylmercury inputs and production. Journal of Geophysical Research – Biogeosciences, 122(7):1922–1939. doi:10.1002/2016JG003721. Martinez, G., S. McCord, C. T. Driscoll, S. Todorova, S. Wu, J. Araújo, C. Vega and L. Fernandez. 2018. Assessment of mercury contamination in riverine fish and sediment associated with artisanal and small-scale gold mining in Madre de Dios, Peru. International Journal of Environmental Research and Public Health.15(8):1584. doi:10.3390/ijerph15081584. Millard, G., C. T. Driscoll, D. A. Burns, M. Montesdeoca and K. Riva-Murray. 2018. Response of mercury in an Adirondack, USA forest stream to watershed lime application. Environmental Sciences:Process and Impacts. 20:607-620. doi: 10.1039/C7EM00520B. Wang, Z., T. Sun, C. T. Driscoll and X. Zhang. 2018. The mechanism of accumulation of methylmercury in rice (Oryza sativa L.) in a mercury mining area. Environmental Science and Technology. 52(17):9749-9757. doi: 10.1021/acs.est.8b01783.